I guess it’s officially springtime. All the snow has been melting (sadly) so I’ve been trying to get in as much skiing as possible. The snow up at the ski hill is all slush, or ice depending where it is. I miss December, January, and bits of February when it snowed all the time. Anyways, this week Hazel and I went to a consignment shop for fun and we found a few new pieces of vintage clothing. Hazel was super excited though because she found this old homemade scooter! This scooter is basically Hazel’s new favorite thing. 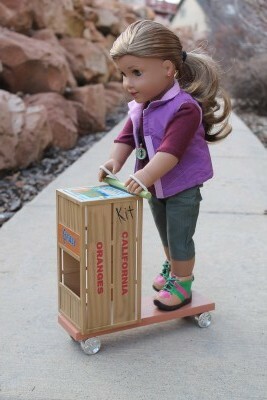 She rides it around all the time for fun and sometimes Paislee and I join in when we’re done with schoolwork. 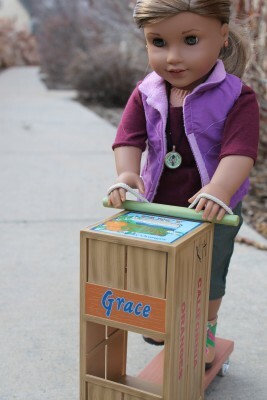 The funny thing is, it has a spot for a dog that was named Grace and Hazel has a cat named Gracie. It’s too bad Gracie is too stubborn to actually ride the scooter with Hazel. 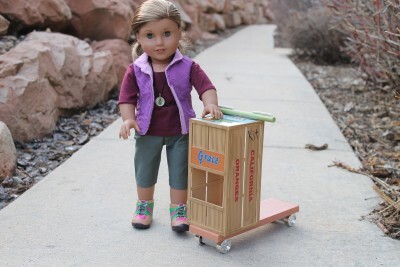 Hazel is wearing this super cute purple vest from American Girl. It’s great for in the winter when it’s cold out but also for a more sporty outfit like this. 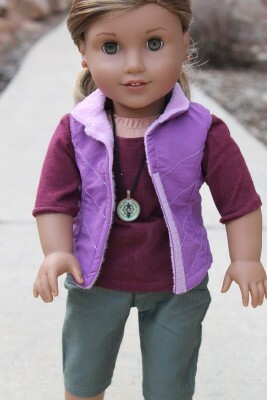 Her pants and hiking boots are also from American Girl along with her compass necklace. Hazel wears her necklace pretty much everywhere. She told us that it was a gift from her parents a few years ago for her birthday. This adorable burgundy 3/4 length sleeved shirt is from Girls & Dolls on etsy. If you go back to the first post on here I’m actually wearing the same shirt. As you can see, we usually borrow clothes from each other.